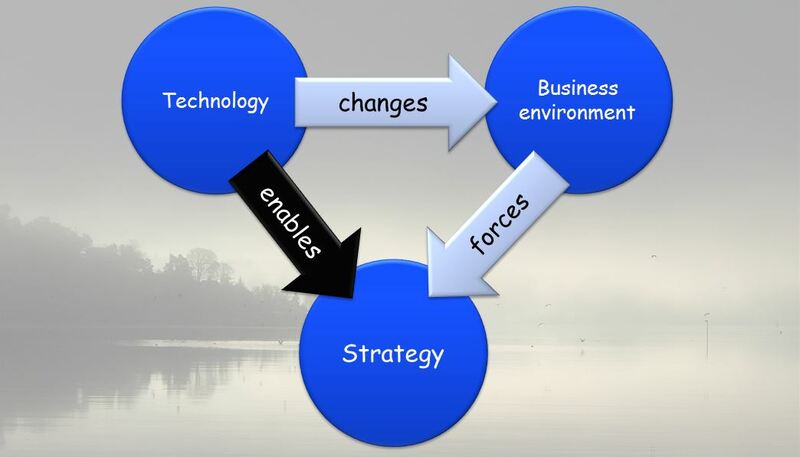 Understanding technology strategy is all about understanding the relationship between how a technology evolves, how it changes the business environment, and how a company must change its business strategy to adapt to a new situation. A common problem is that companies wait too long to respond: When you see changes in the business environment, i.e., when your sales, market share or profitability is beginning to take a hit, it is very often too late. You may not go out of business, but you may have lost chances to influence the market yourself – and you end up forced to adopt specific strategies, with little choice in the matter. If you understand the technology and can predict what the changes will be before they are measurable, you have much more choice – you can choose between more strategies, you may be able to take advantage of the new technology, using it to enable strategies rather than fence you in. This requires understanding how technology evolves, at what point it will become a factor in your markets, and how you can make use of it for your own purposes. Tversover Consulting specializes in advising companies on technology evolution and strategy formulation. Our goal is to help you anticipate business environment changes and create new strategies early, before they become market imperatives.